I am very pleased to introduce the C’est Si Bon! 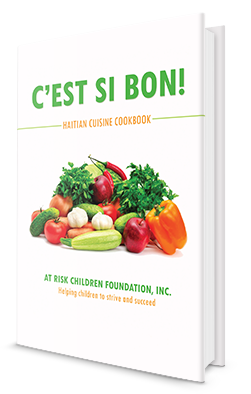 Haitian Cuisine Cookbook by At Risk Children Foundation, Inc. (ARCF) and to share with you the efforts of At Risk Children Foundation to improve the conditions in Haiti. Haiti is a nation rich in culture and history. Nevertheless, it is the poorest country in the Western Hemisphere. Political instability, insufficient economic opportunities, environmental degradation, and inaccessibility to education, among other causes, perpetuate the cycle of poverty in Haiti. The devastation of the 7.0 magnitude earthquake that struck Haiti in January 2010, killed more than 230,000 people, displaced over 1.5 million, and orphaned thousands of children. UNICEF’s report, The State of the World’s Children 2015, estimates that at least 340,000 children in Haiti are orphans (as of 2013). At Risk Children Foundation aims to alleviate the problem of poverty in Haiti and improve the standard of living by providing access to education, sustainable programs, and basic care to vulnerable and orphaned Haitian children. The C’est Si Bon! Haitian Cuisine Cookbook was created to help fund these programs and 100% of the proceeds will go directly toward these initiatives. C’est Si Bon! Haitian Cuisine Cookbook is a collection of recipes that captures the diverse culinary culture of the region. This book gives readers the chance to experience Haiti’s exciting gastronomic fare while contributing to a good cause. Breaking the intergenerational transmission of poverty, violence, disease, and discrimination is an attainable dream. To learn more about this book, the projects it will support, and the work of ARCF, please explore the other sections of this site or visit our website at www.atriskchildren.org. Copyright © 2015. At Risk Children Foundation, Inc.. All rights reserved.